Estate was founded in the 1960s by Manuel Gonçalves, a visionary entrepreneur who always fought for the highest standards of excellence. Located in the Vinho Verde region, till this day the winery still remains family owned and operated. In the 40 hectares of vineyards, the predominant grape varieties recommended and authorized for this area are grown from a soil rich in silica and clay and with excellent exposure to the sun creating Alvarinho, Arinto, Sauvignon, Loureiro, Pedernã, Trajadura and Fernão Pires. TASTING NOTES: The wine is refreshing and juicy with white peach, pear and lemon flavours in the mouth. In this wine you taste the Portuguese sun and at the same time you recognize the refreshing influences of the Atlantic Ocean. TASTING NOTES: Balanced combination of three varieties – Loureiro, Arinto and Trajadura. A young wine of quality and freshness combined with, harmonious citrus and floral notes. A pleasant finish that lasts in the mouth. 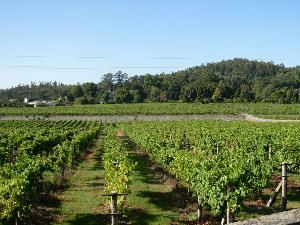 Please click here to view the wines available from this estate.